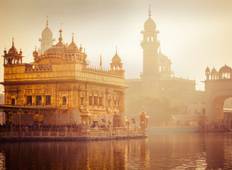 Find a Train & Rail trip that explores India. There are 26 tours to choose from, that range in length from 3 days up to 54 days. The most popular month for these tours is November, which has the most tour departures. "It was more than exoected I loved every minute and Suri is the best guide ever he..."
"The trip was amazing, I Saw so many wonderful things, and meet new friends. I was..."
"The tour was very well organised ,hotels were excellent and better than we expected...."
"Great service for us in Golden triangle tour and Ranthambore. I booked this tour..."
"Tour Guide Hilal was Guide for Agra and the Taj Mahal. Hall was Incredible Historian..."
"Really great trip. Inspirational and friendly locals; great food, knowledgeable tour..."
"The trip explored a lot of great destinations and it was great to utilise public..."
"Excellent well thought through trip. Great mixture of different experiences. Great..."